Whangarei Rotary Club members Shirley Faber and Peter Mulhare, Ani Hemara, Hikurangi School acting principal Stacey Richards and Shona Whitehead. Photo/John Stone. 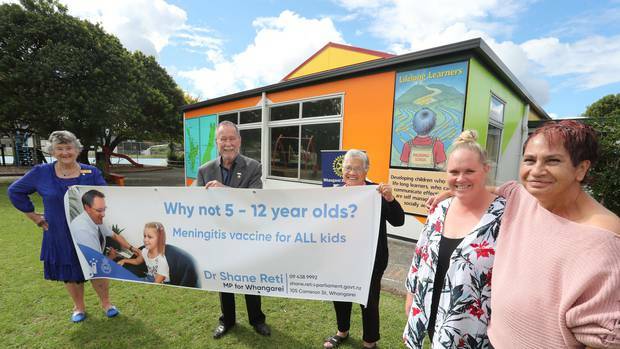 Hikurangi School children who were ineligible for the free Meningococcal W vaccination are now set to get the vaccination after a fundraising campaign has raised nearly $18,000. When Shona Whitehead found out most of the young people in her Hikurangi community group had not been vaccinated against the deadly meningococcal disease, she wanted to help. Whitehead initially launched a campaign last month to raise $20,000 to vaccinate about 200 children who were aged 5 to 12 years and therefore ineligible for the free Meningococcal W vaccinations. Whitehead set about gathering donations from the community, collecting $6025 to date. She met with Whangārei MP Dr Shane Reti who agreed to deal with the medical side of things - ordering the vaccines at cost and conducting the vaccinations. Whitehead also approached Whangārei Rotary Club for some funding help. Club member Peter Mulhare said initially they agreed to give Whitehead $1000 and see if they could get others to help, before realising they might be able to help on their own. "She was really passionate about the whole cause. She was fighting for the kids." He acknowledged many families have more than one child at the school and could not afford to get them vaccinated. Mulhare approached the Harold Thomas Rotary Trust who agreed to match dollar for dollar whatever Whangārei Rotary could raise. He went back to his board and suggested increasing their contribution to $3400 and secured a further $2500 in a district grant. Along the way the number of vaccines required was revised back to around 170 which takes into account students who may have already had the vaccine, and some who may opt not to receive it. It meant that the total of $11,800 donated by Whangārei Rotary got the campaign over the line. Whitehead said altogether $17,825 had been raised. "The big thing was the confirmation of the money, it's given us hope for our children." She said getting the money was "marvellous" particularly in such a short space of time. "I did have doubts, that's a lot of money to raise." Whitehead had set a deadline of the end of April because the vaccine can take up to a month to build up immunity and winter is coming. It was also important because seven-year-old Alexis Albert from Hikurangi died from the disease last winter. "Now the next part is consent," Whitehead said. She is working through getting a consent form together and distributed which will gain permission for the children to get vaccinated. Reti commended Whitehead, her mum Ani Hemara, the community and the rotary club. "It's sending a signal that Northland children need to be vaccinated... this is the Hikurangi community standing up." He has been in negotiations with the vaccine manufacturers and said he has the ability to order up to 220 vaccines. Reti said the campaign has funding to purchase around 170-175 vaccines. He said if the campaign gets through those vaccinations and there are still children remaining then they will look to address it. Reti said he was planning to carry out the full day vaccination programme at the school "in the month of April" after Easter. Whitehead said there are still two events planned to raise money for the campaign, and funds raised from those events will still go towards vaccinations. Three people in Northland have died from the disease since the strain came into the country last year. A vaccination programme was launched in the region late in the year. Just last month officials were urging people to get their eligible children vaccinated after a Hokianga child contracted the potentially fatal illness. The child was treated and discharged. Whitehead was so grateful to Whangārei Rotary Club she has decided to join them as a way of giving back.